The Testosterone Booster for Strength & Cutting! Why Is 1-AD So Good? Where to buy “1-AD” ? How do 1-AD and 1-Testosterone differ? 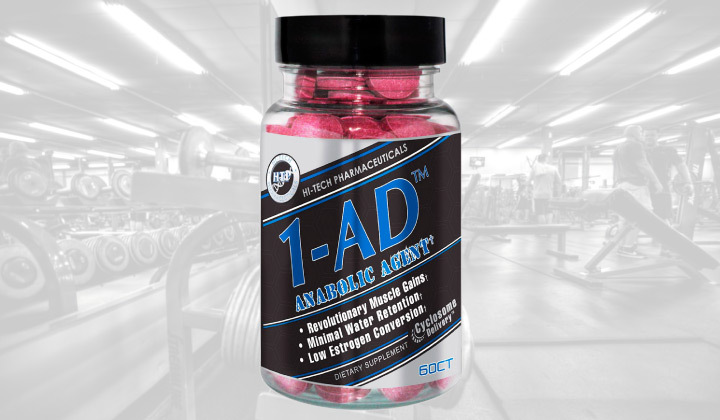 Hi-Tech presents 1-AD with 1-Andro, a new and long-awaited supplement for athletes who strive to increase their muscle strength and lean muscle mass, as well as for those who try to avoid the water weight and bloating which usually come together in the process! The novelty 1-AD prohormone produced by Hi-Tech Pharmaceuticals perfectly suits athletes who are eager to cut fat, but the product can even be used for bulking cycles if you keep to a proper diet. The supplement includes 1-androstene-3b-ol, 17-one Decanoate, known to be among the most potent compounds taken by sportsmen to build lean muscle mass and increase muscle strength in the shortest time possible. You have never experienced anything like this before, so, be well prepared to see the good results from Hi Tech 1-AD beyond your expectations. The main substance, present in 1-androstene-3b-ol, 17-on Decanoate, turns into 1-Testosterone. It’s very important because 1-Testosterone is well known to provide substantial and clean mass gains, leading to a huge increase in muscle strength after just several days of regular taking. Moreover, all this is gained by avoiding bloating. However, that is not all what this product has in store for you. Hi-Tech also added 5a-Hydroxy-Laxogenin to the formula and this compound is known to provide natural muscle and strength gains. These two components boost all the necessary body processes to achieve perfect results. Both 1-AD and 1-Testosterone are actually very similar and affect the human body in one and the same way. However, there is the GREAT difference between them because 1-AD has Laxogenin in its formula. Because of this compound, testosterone won’t convert to estrogen! 1-Testosterone won’t provide the same benefits, but if taken in combination with other supplements, it balances the processes out. One more thing, 1-AD is meant mainly for beginners while 1-Testosterone is more versatile in this regard. We recommend you to take 2 tabs in evenly spread time spans during the day. Do not exceed 4 tabs a day. Also we recommend to consider one more product from Hi-Tech Pharmaceuticals – Anavar! Increases Muscle Size and their Strength.